What is the best editor for Autohotkey with regards to syntax hightlighting, command completion (intellisense), testing etc. I am doing a bit of Autohotkey programming, and being spoiled rotten by Visual Studio, I really miss these features - especially being new to the language/framework. Go to the Sticky: Catalogue of scripts and Rosetta Code challenges at the Scripts & Functions section of the AutoHotkey forum. I have just discovered that the free editor Notepad++ has an AutoIt syntax highlighting mode that seems to support AutoHotKey syntax. To use it, I just opened my .ahk file in Notepad++, then selected Language->A->AutoIt. I'm using PsPad 4.5.3 (freeware), it supports AutoHotkey syntax highlighting, command completion, etc. The only feature I missed is code-folding, but for AutoHotkey scripts it doesn't seems to be a big problem. Steep learning curve but Emacs has an AHK mode. I vote SciTE4AutoHotkey. It's the closest thing to an actual IDE for Autohotkey. Use Sublime Text , it's the most powerful thing in the world. Plus, if you want you can try my Sublime 4 Autohotkey patch which makes Sublime Text more suitable for Autohotkey coding. 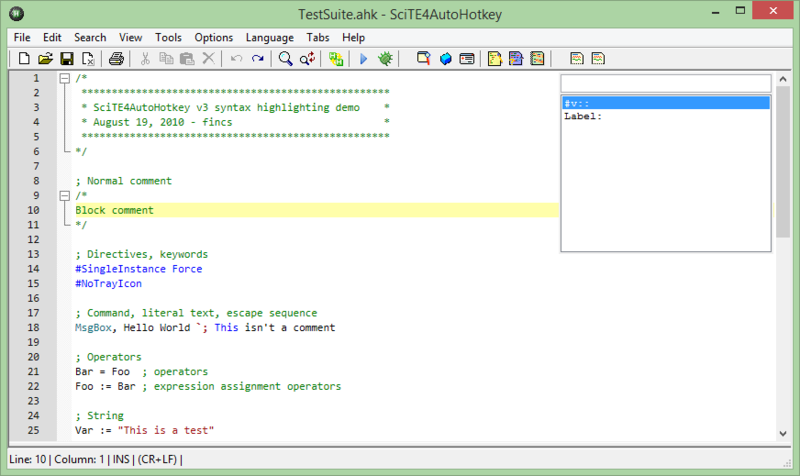 Scite4AutoHotkey is no doubt the best one ranging from beginners to quite advanced users. Once you want to go more advanced, you might want to move to some other kind of IDE, but for an editor, Scite is best. There is an addon for VIM that does syntax highlighting for autohotkey. Not the answer you're looking for? Browse other questions tagged editor autohotkey or ask your own question. What NAnt editors are available?